The Forest Hill Society has drafted a proposal for a one-way scheme for a small section of the Perry Vale road. The premise of this proposal is that with some limited changes to the road/walkway layout, this area could set the basis for a more attractive location: for commuters, residents and businesses. While an outline scheme has been proposed, we would expect that a more detailed review (including a possible temporary trial) would be carried out by the appropriate planning and transport authorities prior to full implementation. We invite you to consider the proposal (shared below), and to let us know your thoughts via the survey link. We plan to then include all responses in a report, and possible Petition, to Lewisham council, as your views will bring some local context to the proposal in terms of local support, perceived benefits of the scheme and any potential issues. Perry Vale is the road adjacent to Forest Hill Station. While in recent years the suburb of Forest Hill has undergone healthy regeneration (in part due to the improved connectivity of its rail station), it cannot be said that both entry points to local infrastructure hub have thrived to the same extent. Perry Vale businesses naturally report high passing footfall, but note that the area does not yet represent a destination for retail or leisure. We propose that there exists an opportunity to foster the kind of organic improvements in area that have so far eluded it: principally through reconfiguration of road usage. There are already commercial developments underway which can contribute to the regeneration of this de-facto hub entry point, and we feel that the proposed changes presented here would impact positively on the character and utility of the area concerned, and reflect many principles of key London and Lewisham policies. 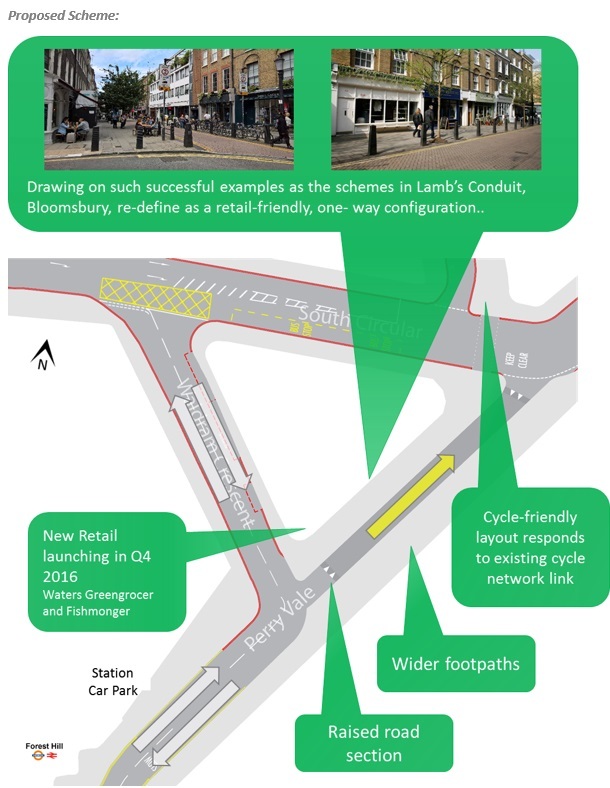 After much consideration, and discussions with businesses and residents, we invite Lewisham council to consider this proposal in its planning cycle. Please complete our survey to let us know your views. I generally like the idea of this. Although I don't think it's just the road that holds back this row of shops. 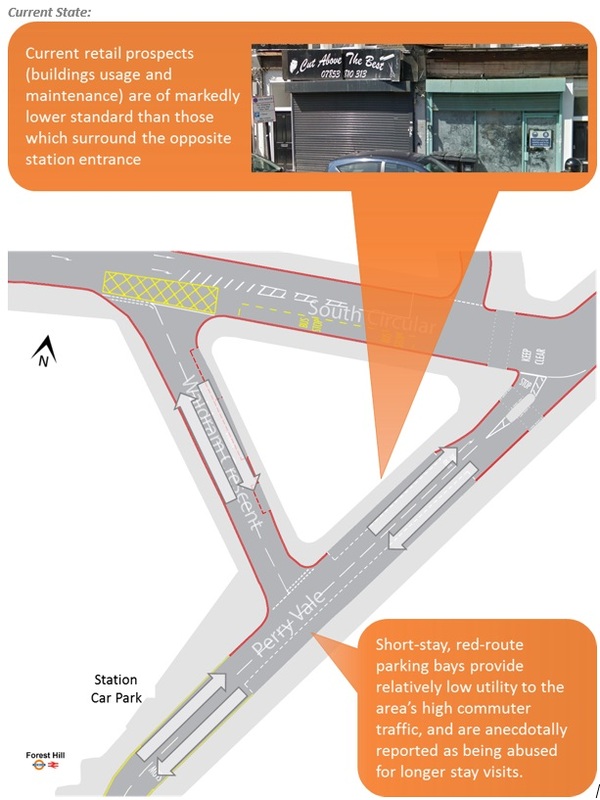 However, what is missing is consideration for the vehicle flow northbound on Perry Vale to access the right hand turn onto the South Circular. This is a useful and safe option, as there is a traffic light control specifically for that flow. The route gives access to that side of Forest Hill and onwards to Sydenham, Beckenham etc on relatively free-flowing roads. The scheme removes this. What alternative do you propose? Left on Waldram and then right across both lanes of the South Circular? Thanks for your comment Medlicott. Our proposal would allow cars to continue along Perry Vale to reach the South Circular (towards Catford). What would not be allow is for turning from South Circular directly onto Perry Vale. Instead cars would need to continue to Waldram Crescent and turn there (not a major detour). We had previously considered the scheme in the other direction, but it didn't work for the reasons you outlined above. Thanks - in which case I fully support it (and will do another formal response on those lines). As you say the turn in the other direction is not a big detour. What would be the objections to completely pedestrianising that section? I'm afraid that the junction of Waldram Crescent /Perry Vale will just even more congested by cars parking of the Banquet Hall. Let's face it they don't use the car park as it is already. Further not sure how this will improve the shops on that corner? Or are you planning to try to relocate the fast food joints and barbers and tattoo parlour in place of funky street cafes and bars? And won't this push more traffic down Westbourne Drive? I have been dumbfounded since I moved here several years ago by the fact that there is not safe crossing on perry vale at the station. There are many children in the area that cross there to and from school. I myself have had too many close calls trying too cross to go to the station. Can we consider safety please? I feel that a stop light at the station could be a start.